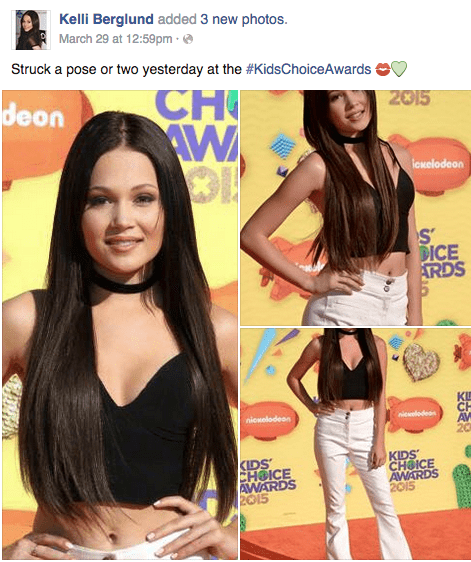 Kelli Berglund goes retro with her fashion on the orange carpet at the 2015 Kids’ Choice Awards held at The Forum in Los Angeles on Saturday afternoon (March 28th). We love her high fashion look wearing her custom cut Hidden Crown Hair Extensions in color #2 with a length of 20 inches. The Disney XD’s “Lab Rats” star completed the look with a black choker necklace and long sleek locks parted in the middle.